The construction of Off-the-Road tires depends, to a large extent, on the intended use of the tire. However, there are common components, to all Off-the-Road tires, including the tread, carcass, beads, breakers and sidewalls. Tubeless-type tires have an inner liner. The tread is the outermost covering of the tire, and is the only part that normally comes in contact with the road surface. It, therefore, must be designed to protect the body of the tire from cuts and wear. Depending on the intended use of the tire, the rubber compound applied to the tread will be changed to customize cut resistance, heat resistance and oil resistance. The tread pattern also has a large effect on the performance of the tire. The compressed air in a tire supports the load placed on the tire. The carcass forms a semi-rigid frame for the compressed air, but is flexible enough to absorb some shocks and jolts. The carcass of Bias tires consists of a number of rubber-coated layers of fabric called "plies." The bead fixes the tire to the rim to support the load. The breaker of a Bias tire is rubber-coated layers of cord between the tread and carcass, binding the two together. The breaker prevents cuts in the tread from reaching the carcass and helps absorb shocks. The sidewall is composed of a flexible, crack-resistant rubber, and protects the carcass from damage. For jobs where chuckholes, large rocks, etc. 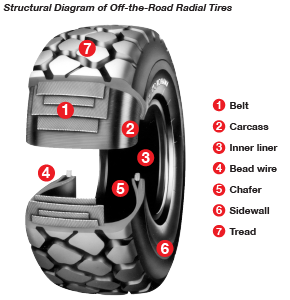 are a problem, tires with high cut-resistant sidewalls can be used. The inner walls of tubeless tires are lined. The liner is made of an air-impermeable rubber compound and is comparable to tubes in tube-type tires. Tubeless tires generally weigh less than comparable tube-type tires and are simpler to maintain because the tube and flap are eliminated. The steel breaker tire has steel cord breakers that give it very high cut resistance. It is especially useful where sharp rock is a problem, and is applicable to loader, dozer, dump truck and occasionally earthmover type tires. The adhesiveness between the steel cord and rubber, however, is more susceptible to heat damage than that of nylon cord and rubber. 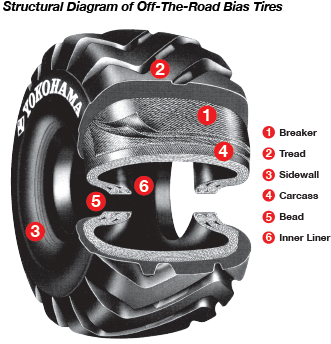 Accordingly, steel breaker tires should not be subjected to conditions where heat generation is great. Because of the difficulty involved in retreading steel breaker tires, they should not be used for jobs where more easily retreaded tires can be used. 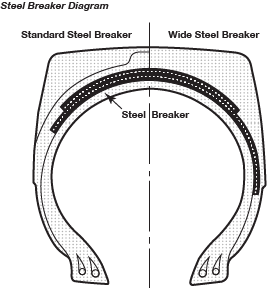 Steel breakers that extend to the sidewall are also available for jobs where high sidewall cut resistance is required. The radial tire has two carcass components, both consist of steel. The first is a single bead to bead carcass ploy which carries the load and supports the tread. The carcass ply runs at a 90 degree angle in relation to the tire bead. The second is low angle steel belts which are placed on the top of the carcass ply and under tread rubber to minimize tread distortion.